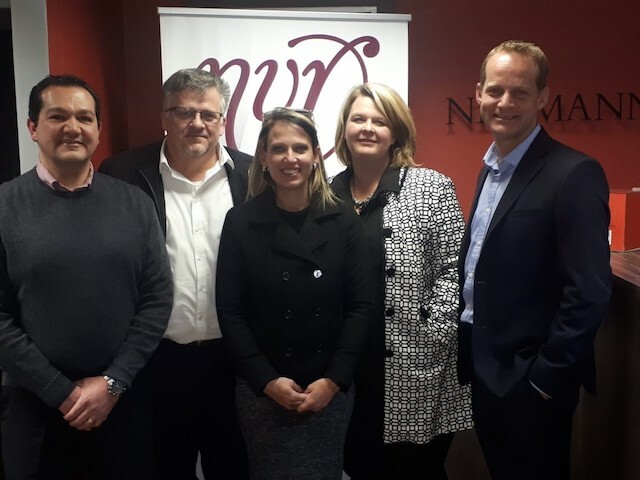 In a historic development that could spell faster and more efficient conveyancing processes, the South African Deeds Office has registered its first electronically signed property transfer. The property of Zelda Lendon (68) was registered in the Bloemfontein Deeds Office early July with the Power of Attorney to Transfer Property electronically signed by both the client and the conveyancer. The electronic signing was completed using one of the country’s leading digital signature platforms, Lexis Sign, which is underpinned by the Electronic Communications and Transactions (ECT) Act and also meets international standards for digital signatures. 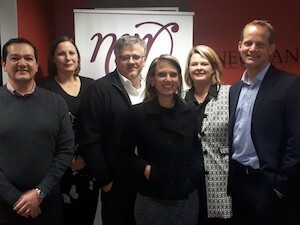 Left to right: George Tsikos (LexisNexis), Petro van Dyk (Neumann van Rooyen Attorneys), André Styger (Neumann van Rooyen Attorneys), Rachelle Blignaut (LexisNexis), Gerda Janse van Renbsurg (Neumann van Rooyen Attorneys) and Pieter Coetzee (LexisNexis) attended the historic unveiling of the new electronic title deed at an event in Welkom. I would be interested to know just how the signing of a power of attorney electronically has ”enhanced” the registration procedures and how it was that this became a ”painless, fast and efficient” process? The manual signing of a power of attorney for a property transaction is not an issue that has caused a single days’ delay in my entire conveyancing career. Given that the rest of the transaction proceeded in the normal way, this report seems to be really misleading. Just how did this make the transaction ”smoother”?Moreover contracts for the sale of land are excluded from ECTA, so agreements of sale or other contracts involving the alienation of land must still be signed manually. The real reason for the delay in conveyancing transactions these days is the delay on the part of the municipalities in providing rates clearances certificates. I cannot, by any stretch of imagine understand how the mere signing of a PoA to transfer electronically enhanced the conveyancing procedure in any way. A good comment and factual as always. Let me get Ewald to give his input. [quote name=”John Christie”]I would be interested to know just how the signing of a power of attorney electronically has ”enhanced” the registration procedures and how it was that this became a ”painless, fast and efficient” process? exactly how would the witnesses sign ? The quote you refer to was an actual quote received from Miss Lendon. We believe that it proves that the Lexis Sign platform the attorneys chose for this transaction is very user friendly and efficient. The attorneys who acted as conveyancer in this matter are based in Welkom with registration happening in Bloemfontein. They are therefore reliant on lodging attorneys and couriers for their transactions. They are confident that they receive great efficiencies from using electronic documents. Thanks for the extra comment Butch and Ewald for responding to the question by John. I imagine, and Ewald must confirm, the witnesses would also sign digitally. Lexis Sign was developed with the South African legislation in mind. The platform allows for the witnesses to be present and to digitally sign as witnesses. The electronic signing of any document for deeds registration purposes is not permitted. May electronically generated signatures be accepted for any act of registration to be registered in a deeds registry? The Act specifically excludes an agreement for the alienation of land and long term lease agreements, but does not refer to powers of attorney’s consents, antenuptial contracts, etc. Only originally signed documentation is permissible. The conveyancer no doubt would have a key-pair already assigned to him/her, but how would the seller have a key-pair allocated? Assuming that the seller did not have a pre-existing key-pair, who would issue the key-pair and how would authentication of the seller’s identity be done without causing delay to the conveyancing process? Perhaps it is necessary to put the whole scenario into perspective. The deeds were not electronically lodged or registered. The preparing conveyance merely signed the prep clause on the PA and the seller authorizing the Conveyancer to appear before the Registrar of Deeds signed the power of attorney electronically before two witnesses who also effected their signatures electronically. The Lexis Sign platform aims to support the entire interaction at the point of signature. Through our partner, LawTrust, we are able issue Advanced Electronic Signature certificates to attorneys as well as clients. [quote name=”Andrew Marshall”]The conveyancer no doubt would have a key-pair already assigned to him/her, but how would the seller have a key-pair allocated? Thank you for describing the signatories and their roles so succinctly. The signatories signed electronically. As the article points out, the documents were lodged in paper form. [quote name=”ALLEN WEST”]Perhaps it is necessary to put the whole scenario into perspective. The deeds were not electronically lodged or registered. The preparing conveyance merely signed the prep clause on the PA and the seller authorizing the Conveyancer to appear before the Registrar of Deeds signed the power of attorney electronically before two witnesses who also effected their signatures electronically. Mark Heyink has written an article that speaks to this resolution. [quote name=”ALLEN WEST”]The electronic signing of any document for deeds registration purposes is not permitted.